The Dressage Foundation's Renee Isler Dressage Support Fund has awarded an $800 grant to youth dressage rider Ayden Uhlir. Ayden and her KWPN horse, Sjapoer, were recently selected for the USEF Dressage Young Rider European Tour to train and compete in Hagen, Germany. Ayden will use the Isler Fund Grant to extend her stay in Europe to train with Johann Hinnemann. Through her time in Europe and with the help of the grant, Ayden will continue developing her abilities as a rider and trainer and will represent the U.S. in international competitions. She hopes to compete in the Under 25 division this coming fall. "Thank you, Renee Isler and everyone at The Dressage Foundation, for this grant. 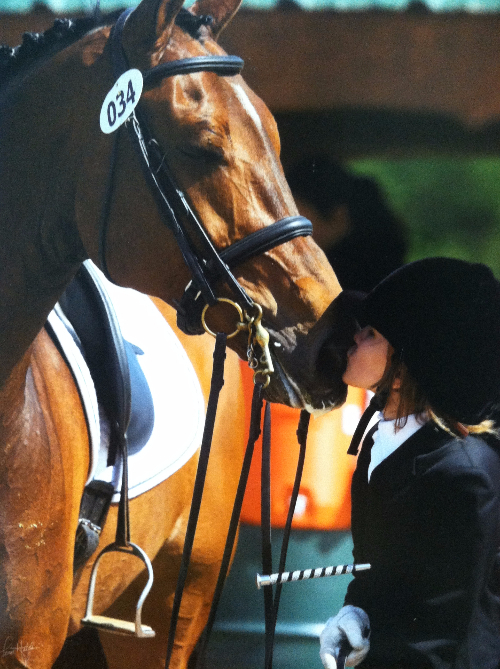 I am so lucky to be part of a great movement to build youth dressage in America,” said Ayden. “It is my goal to continue that growth and help other young riders coming up in the future. If we all work together, there is no stopping the potential growth of dressage in the US." Grants are available for young riders, amateurs, and professionals through the Renee Isler Dressage Support Fund. Since 2008, the Renee Isler Dressage Support Fund has provided nearly $40,000 in grants/scholarships to support the further education of the recipients.